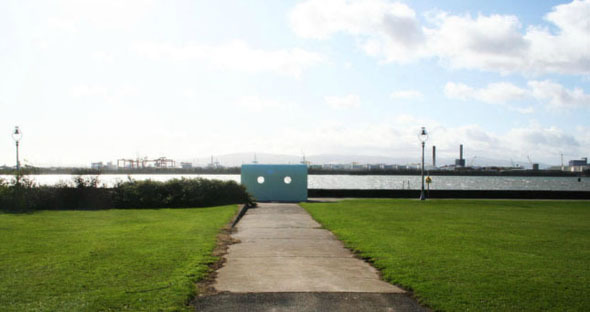 This primarily residential area, less than 5km from the centre of Dublin’s capital is one of a number of similar areas which wrap around Dublin bay with strong visual links across the water. Thousands of locals and tourists use the promenade strip every week. The proposed works are imminent with contracts due to be awarded. They are based on the premise that by combining the flood protection and pipe-laying works savings can be made as no excavation is required – the pipe is simply laid on the existing promenade and the earth mounds are build over it. Public outcry has focused on the lack of images showing the visual impact of the works. The written visual assessment by the local authority who are responsible for the plans, states that the barrier will have a ‘generally positive’ effect on the promenade. 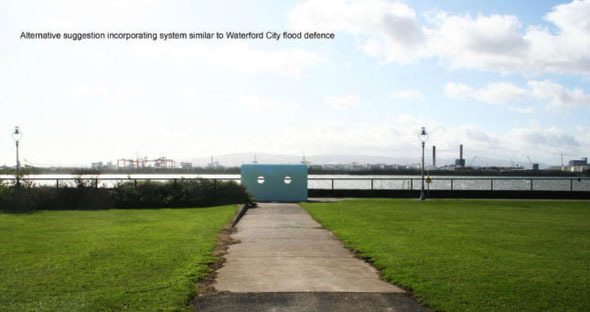 Theses images have been generated by a collaboration of local architects and planning professionals to redress the deficit of any visual representation by DCC – and to afford people an opportunity to get some sense as to the alteration to the environment that may be expected. The images of the DCC proposals are an accurate representation based on the available technical data from DCC and its consultants. The local architects involved are Davey + Smith Architects, Antoinette O’Neill Architect, and 3RRR Architects.